I have tried to make this class as easy as possible to use. You have control over the filter process unlike other alternatives, and can input a string or an entire array to be cleaned (such as $_POST). ** SQL Injection feature has been added. Prize: One subscription to the PDF edition of the magazine by PHP Architect One of the most common security problems of Web sites is the vulnerability to cross-site scripting (XSS) attacks. It allows to steal values of cookies that can be sent to different sites from those that originated the cookie values. This may allow an attacker to access a site impersonating an authenticated user by taking advantage of a stollen session cookie. This kind of vulnerability exists on sites that display information provided by the users without properly escaping it before presenting in HTML pages. If the user supplied information to be displayed is unformatted text, it can be easily escaped by using the PHP function HTMLEntities(). This class provides a solution to perform the necessary cleaning of HTML code from dangerous cross-site scripting attack code. to filter out malicious code, or simply unwanted html tags for style reasons. It can be used to prevent cross-site scripting (XSS) attacks. own settings, then call its process method to clean the form input values. to allow automated and extensive filtering of input with anti-XSS capabilities. Unfortunately, php's inbuilt strip_tags($) doesn't filter out unwanted attributes. you would like to use into your website's classfiles directory and include it. Setup either just a tags array, or additionally an attributes array. Instantiate the class with your settings. Process as many input variables as you like. The example.php file shows you working examples. You can pass a string variable or an array-of-strings. - $connection is valid MySQL-Resource variable. - $source is some string containing SQL injection attack(s). customisation:                  - You have control over which tags and attributes to allow. - Auto-strip blacklisted tags and attributes, as well as ALL action listener attributes. Blacklist:                      - Choose to strip blacklisted problem tags and attributes. It has come to my attention that there is indeed a PEAR package to format bad html and XSS. I do feel they take a different approach to me, and do not offer customisible tag-stripping. They do however offer more substantial XHTML reconstructing, and a stable alternative to this tool. I'd love to know if you're using the InputFilter class, and what you think of it. Gianpaolo Racca, Ghislain Picard, Marco Wandschneider, Chris Tobin and Andrew Eddie. Many Thanks to everyone else who has emailed! 1.2.2    - Improved nested tag detection. and well as allowing for numeric characters in tags on line 133. - Patch accepted: Marco Wandschneider - Wrote PHP5 version that does not cause any E_STRICT warnings. - Bugfix: Fixed a really dumb bug that was causing arrays to not be parsed. 1.2.1    - Patch accepted: Gianpaolo Racca - Added trim() to line 195. 1.2.0    - Updated example-factory page - looks nicer, added "inject sample data" feature. - Many more XSS blocking features. - Rewrote some of the parser code over to be more efficient. - Have stopped producing seperate classfiles for php4 and php5. The current classfile will work with either! - User-defined arrays are converted to lowercase at object creation. A somewhat obvious problem I initially missed! 1.1.1    - Bugfix: to do with spaces in between attr name and value. - Bugfix: to do with single attributes. 1.1.0    - Support for array as input. - PHP5 version of class available. 1.0.1    - Bugfix: involved ignored tag attribute values with spaces in. index.php Example Play around with your own examples on the fly. This is a horrific design. Team of dutch IT specialists. Lists what tags etc are blocked if "xssauto" feature is on. Interesting page for reference purposes. 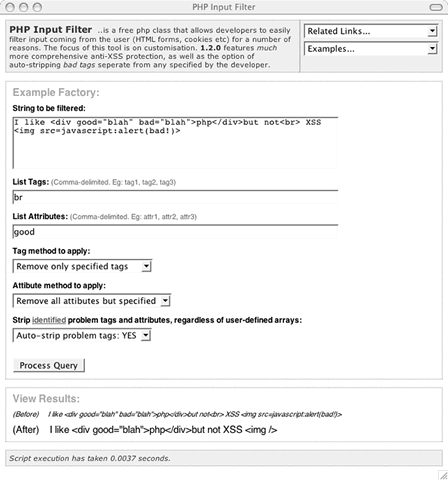 Filtra tus input con "inputfilter"
How to Avoid Cross Site Scripting Attack In PHP?